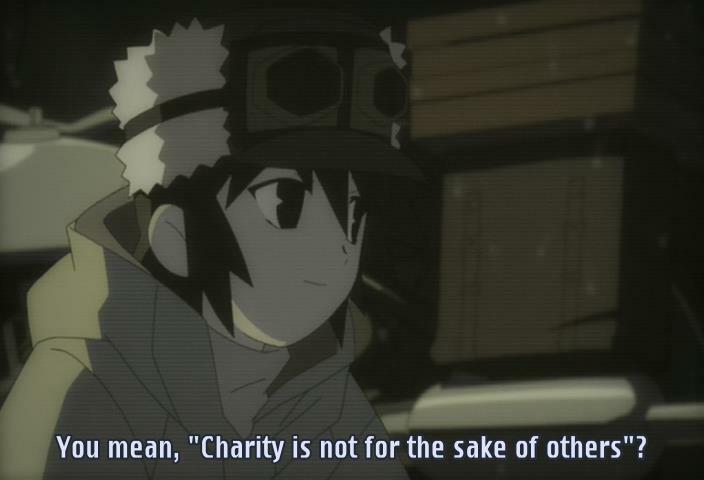 Journey with Kino’s Journey – Second Stop – Hard Questions (Monthly Watch) « Geekorner-Geekulture. Well, before we get to what this episode was about, let’s talk about talking about what an episode is about! Ok, so here’s the thing. I’ve been to too many philosophy classes, but it’s also something that I came across in some of the more philosophical Sociology courses I’ve taken. We’d read a text, or get told of someone, and everyone would nod along as if they understand – and then the lecturer would ask us, “What do you understand? What is he saying here? Why is he saying this specific thing in this segment? Who is he talking to, or about?” And you’d see a lot of blank faces, furthered by the fact no one wants to venture an opinion that’d be shot down. But you see, we all nod along, thinking we get what something is about, until we’re shaken out of our complacency, until someone points out that this “mutual understanding” we have may not be so mutual. That’s why instances where something apparently disrupts the Social Contract which we call consensus can be so unsettling. 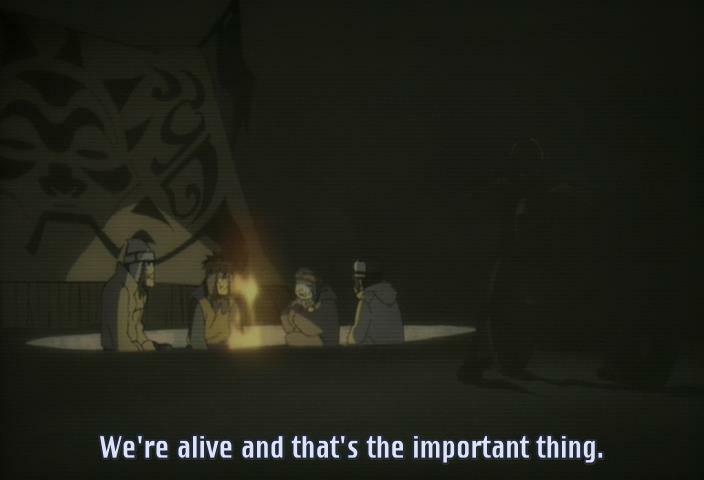 And now we’re back to Kino’s Journey. What is this episode about? I mean, it more or less told us, so we’re all on the same page, right? Right? Well, of course we’re not. And once I tell you what I think the episode is about, or the show says it’s about, we’ll all nod and agree, or disagree, but it wouldn’t be as interesting as the thoughts the questions raised within us, as always. So, what’s the episode about? On the surface level, which is what it speaks loudly about, it’s about hunger, and it’s about food. It’s about people treating one another as commodities, as strangers on the route that are there to be a stepping-stone, for our survival. Kino knows her choice is arbitrary, and she accepts it. She’d kill someone else to help humans survive. Things were already killed for the sake of her survival. Why did she make this choice? Because she’s looking out for herself, and those like her. There’s nothing outside her perspective that makes her worthier of survival than those she kills. And that’s also why the position of the slavers is understandable – yes, they enslave other people yes, they killed them, but it was either they do it, or they die. And that’s the sort of “post-moral” world Kino seems to exist in. If it’s either I die or you die, then there’s no real reason to prefer one of us over the other, except we’re we, for each of us. The actions we take? We’re taking equivalent actions either way. On one hand, that’s the best argument against eating animals – it is killing them, for us to survive. But on the other hand, we’re going to stand on others’ lives either way. But living in a “post-moral” world doesn’t mean Kino doesn’t have a code of honour. You can say that the devolution from one world, with shared morals, perforce leads to one where people adopt personal codes. She does feel a moral obligation for those whose lives she had taken to keep hers going – now she must live on, so their lives wouldn’t be in vain. Kino must not die, not just for herself, but for the sake of the three men she killed, and for the sake of the three rabbits who fed these three men. Anything else, and it’d have been better for her to die instead of them. Of course, that code runs a tad counter to her mission as a traveler – she needs to keep going at least until she gets a new experience, and costs someone, or something else, their lives. Kino’s code means she will not take advantage of others, when it’s not a question of survival, and that she’d be true to her word. Every traveler needs a compass, to remind them not just of where they’re going, but where they came from, meaning what is home, and home is the self, even should we escape it – because we forever define ourselves by the steps we’ve taken, and yes, the lives it took. First, calling it “Hidden question” is a bit tongue-in-cheek, because the questions are those we ask, and then again, because this question is actually asked twice during the show, and answered but once. “Would you do it again?” Hermes asked Kino. Earlier, not asked, she still answered the question, saying she’d have done so again – killed the rabbit, for the sake of her fellow men, who could repay her, or just because they’re more similar to her. 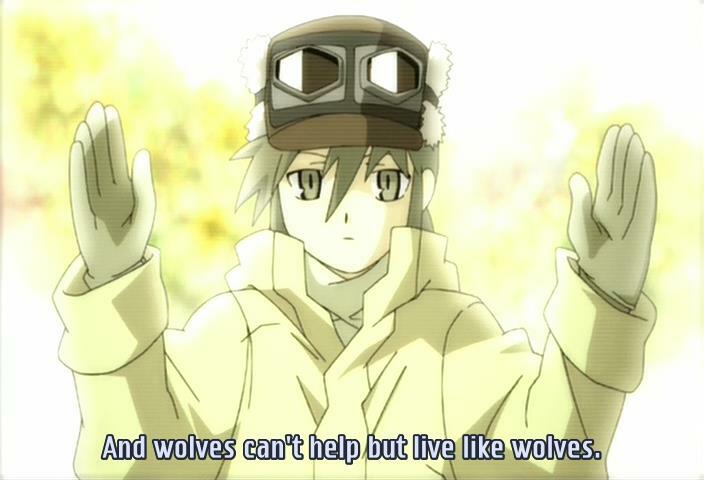 “Metaphorically speaking, we’re wolves, and wolves can’t help but act like wolves.” – What did the eyecatch say at the end of the episode? “These things will always happen, because we’re only human.” So here the “Wolves” means “Humans”. So what is the “question” here? The question is one of the oldest ones of them all, speaking about the nature of free will, and of our own. If we have a certain nature, as humans, as wolves, are we able to break free of it, and make different choices? If we are to say we’ll make different choices when our previous ones used up another, is this experience and wisdom showing through, or saying that the other’s sacrifice was in vain, because you say it was needless? Perhaps it might even show a lack of respect for our past selves, and those who helped it get there – as we renounce our past self for the sake of one that could never be. If we must be true to our nature, and our nature is to use others, then why struggle against it? Why feel guilty over killing another to help us survive? That brings us back to the “post-morals” world. Of course, a post-morals world is the same as a pre-moral world. A post-apocalyptic setting is also a pre-civilization setting. “The World Moved On” is still the most profound way to describe a post-apocalyptic setting, from Stephen King’s The Dark Tower. Kino didn’t answer Hermes when he asked her at last whether she’d have done it again. It? Helped people she came across? Killed them should it be her or them? She’s Kino, and she’ll do what Kino does. It doesn’t bear mentioning. And if she is willing to change, and it’d be her lives that sustained her through that change, would that make the cost the three rabbits paid worthwhile? Honestly, it’s the question, and the lack of answer, that matter. Any answer would be a narrative, and not as interesting as the asking of the question itself. Kino will not share her food, even if others would die due to it. She protects herself. She also will not hunt though that’d let her keep her stock of food – killing is for when life is on the line, and something likely died for her food either way. “Charity is not for the sake of others.” – “A rabbit wouldn’t give me a ring as thanks.” – Still looking out for herself. Charity is done out of self-interest, even if it’s to think of oneself as a human and not a wolf. “Persuader”, a gun is called. Almost as good as “Pacifier”, from our own history. 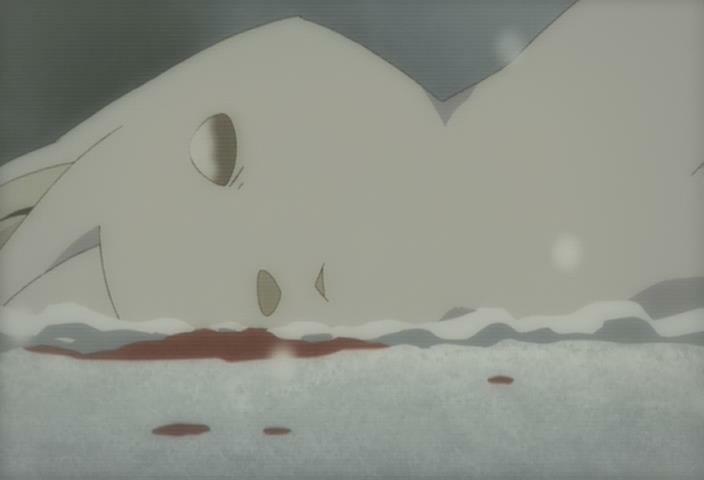 “Are you hurt?” – “No.” – Kino isn’t hurt, but what does this say of her internal landscape? “Would you do it again?” – Is Hermes talking about helping the people, or killing them? Do you think Kino would’ve done it again? Why did she not answer Hermes’ question? Why do you think Kino chose the men over the rabbits, considering she said there is no real reason to prefer one over the other? What’s most important, to you, the narrative, the questions people raise about it, or the answers provided to these questions? As question #4, but which is most interesting? And how do they interrelate? Feel free to answer as many of these as you like, in whichever manner you’d like, or discuss the episode or the main write-up while ignoring these. 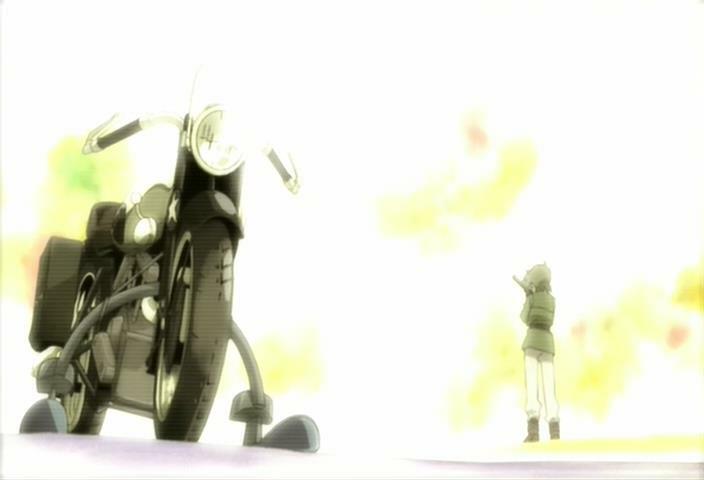 This was the first episode of Kino’s Journey I watched, and unlike the selected must-watch episodes for other shows (like the mushrooms in Samurai Champloo), I feel this episode does an excellent job of introducing you to what Kino’s Journey is ‘really about’: Interpreting and reinterpreting your actions first from the lens of your own assumptions and next from after those assumptions are upended. Of course you should save people, and it’s silly to weigh animal lives against them… but what if they aren’t the people you thought they were? And when you look at the rabbit pelts after seeing what happened to the people they nourished, you realize that it really was a waste. Despite this episode not taking place in a particular Country, the wildly different laws and moral philosophies are put front and center here; this is a world where it’s easy to run into people that are very different from you, showcased by the example of actively celebrating participation in the slave trade (an easy shortcut for capital-e Evil for me). I always saw Hermes as asking about whether Kino would help strangers again, after seeing what happened this time. I also remember her responding in the affirmative, so my memory has reframed my beliefs as canon; despite introducing a legitimate risk to what would otherwise be a purely good act of saving people, it’s still worth the risk to save people. As for why she still chose humans over rabbits, I read that more as someone musing over the philosophy of a situation and what ‘should’ be done while acting on unexamined personal morals. Of course you choose humans, you empathize more with humans, they’re like you, you’d want them to do the same for you, they’d recognize a debt to you, they live longer than rabbits and those lives create more that is relevant to you… but those are just words that explain the decision after you’ve already made it. People don’t always understand why they do the things they do, why they hold the values they have. Philosophy is about examining these unspoken rules, but that doesn’t necessarily translate to changing those rules. Most interesting is the narrative itself; a bad story that raises an interesting question might be made salvageable by that question but it’d still be a shame that the question didn’t get a narrative befitting it (see: C-Control, Kado). A good story with boring questions will at least do the work of entertainment for you. The answers to those questions help broaden the experience, but you need an experience to start with.